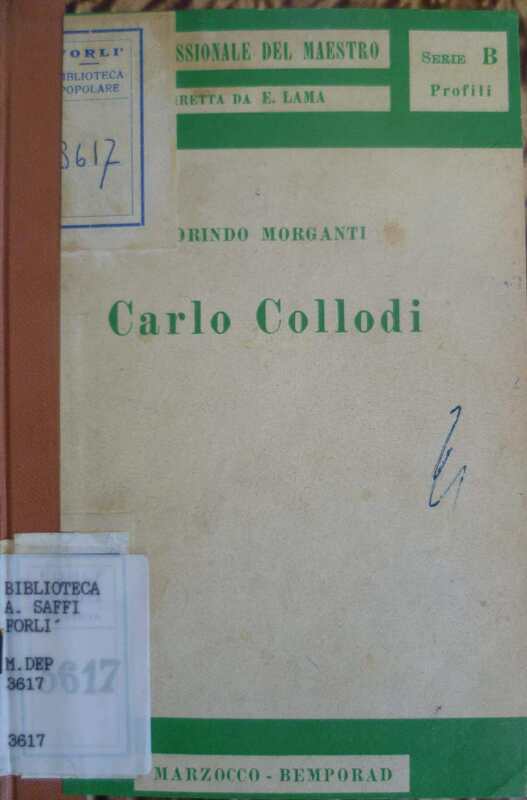 Other biographies of Carlo Collodi, selected and annotated by Matteo Raggi and ordered by date of publication. 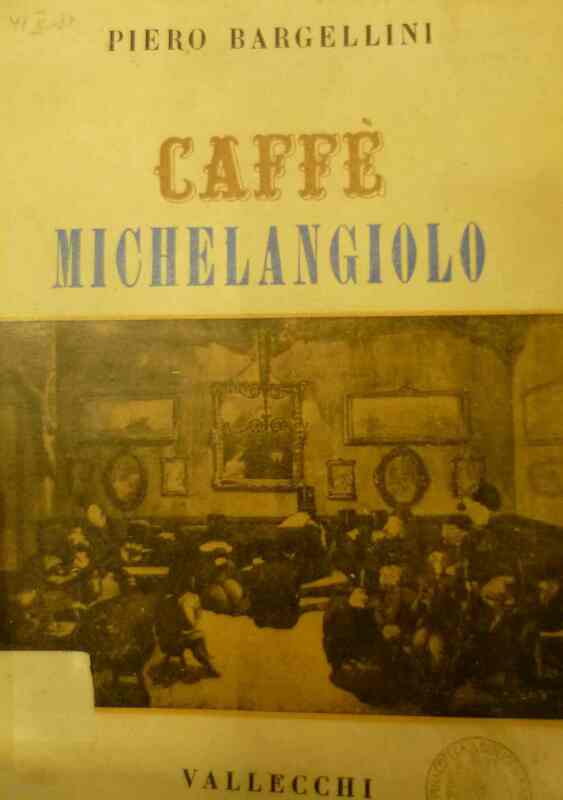 Signorini, Cartoonist and caricatured in the Cafe Michelangelo, Florence, Civelli 1893 [in the library in Genoa, Leghorn, Cesano Maderno, Parma, Milan, Urbino, Rome, Bassano del Grappa, Alassio]: here Signorini remember the song (typically traditional lament sung by the blind) “Eater” that Collodi could not know, before the publication of the story, and perhaps it inspired the name. 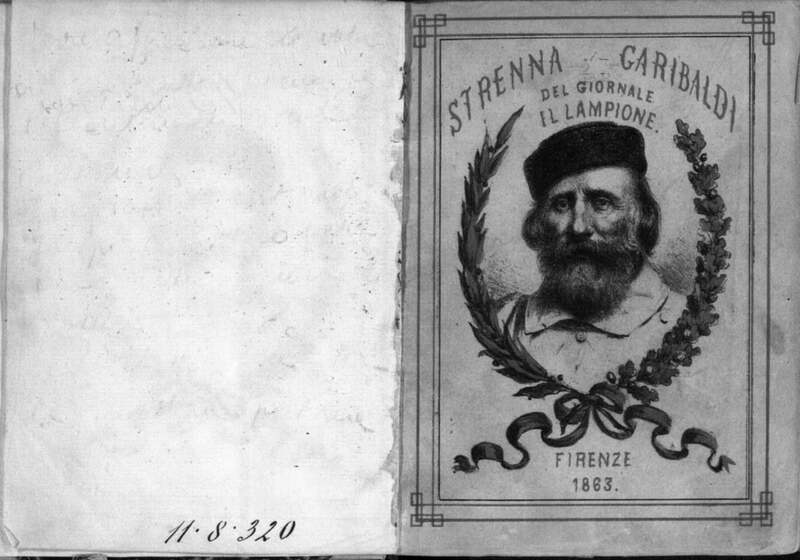 Ippolito Lorenzini, Collodi, in The Giannettino Sunday, 25 November, 1906 [in the municipal library of Forlì, probably also findable at the National Central Library of Florence and the bibl. Marucelliana Florence. 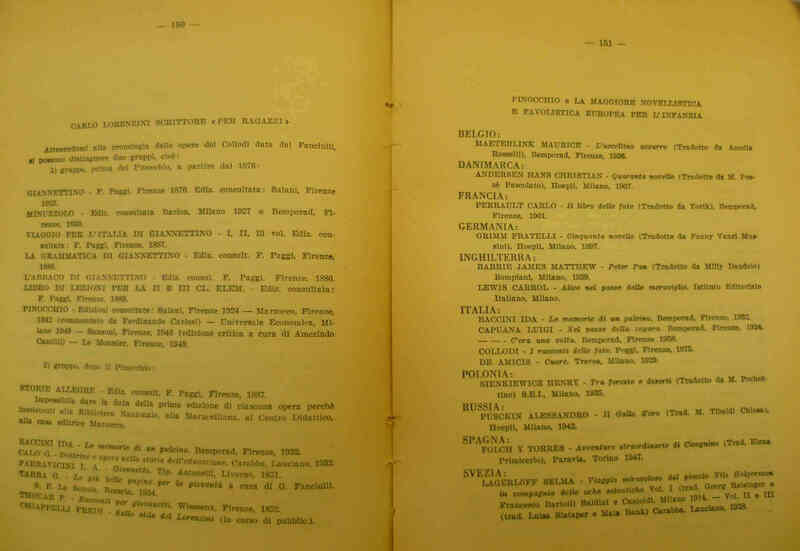 P. Hazard – Children's literature in Italy, in Revue des Deux Mondes of 15 February 1914, reprinted and revised in Books, children and men, Paris, Flammarion, 1932 (Trad. Drink. Armando Armando Editore, Rome, 1959). 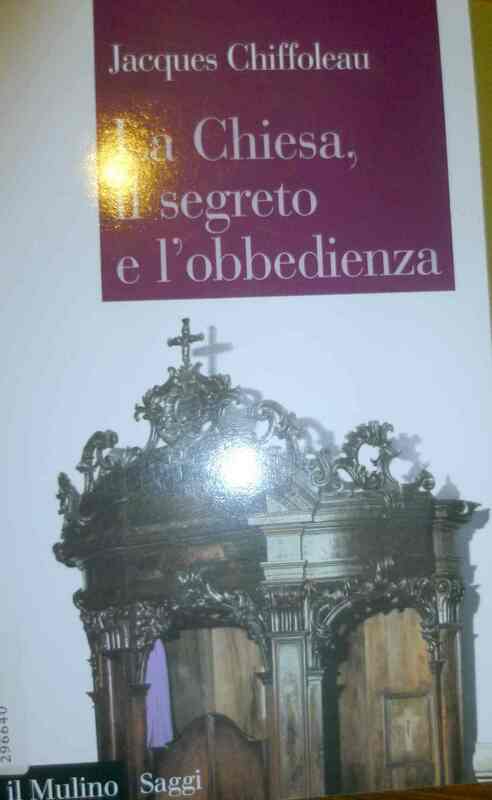 [the library in Forlì]: I read, interesting. 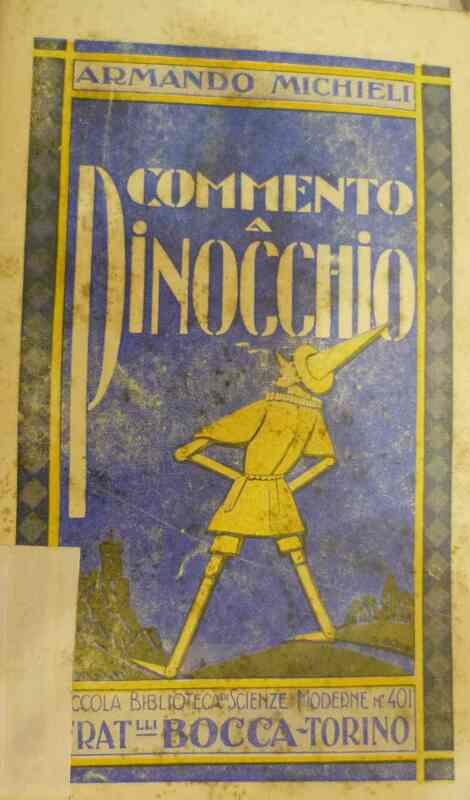 Armando Michieli, Comment on Pinocchio, Turin, Mouth, 1933 [forli library and many others including www.internetculturale.it ] Arturo Pompeati comments Comment Pinocchio arming of the Michieli 1933, pointing out that the story is allegorical. 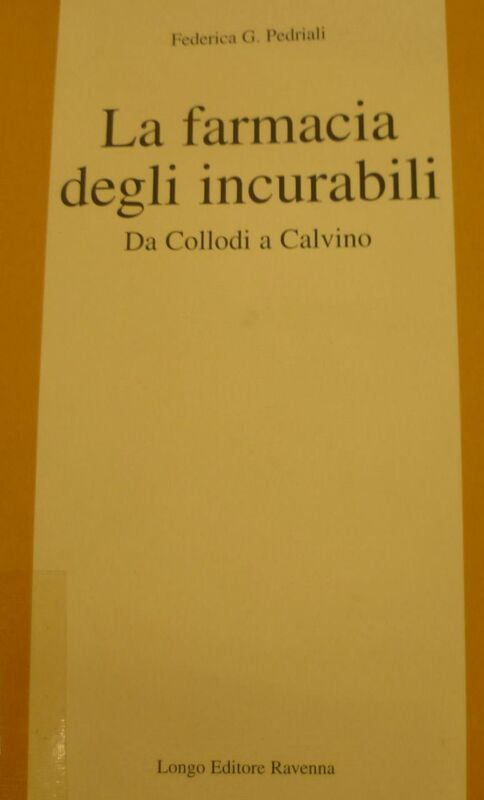 Alberto Savinio, Collodi, in Narrate, men, Your storia, Adelphi, Milan, 1984, IV ed. 2009, 1942. 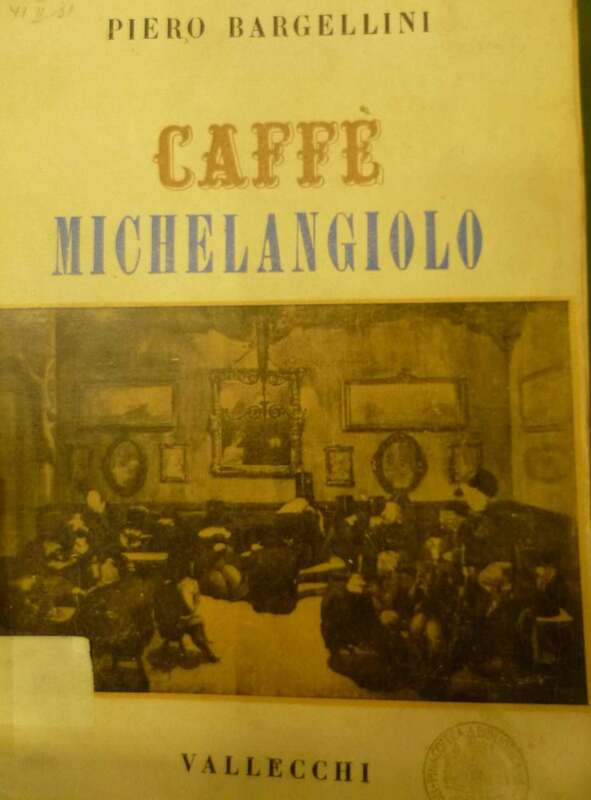 [Library of Faenza] The cousin of De Chirico is very sympathetic to write, sometimes it is not clear if he says things real or not, seems to have been documented and then has added color,sympathetic describes falling in love as the parents of Carlo Lorenzini and how shockingly describes the mote of Collodi with the same text identical to the final of the life of the puppet Pinocchio, placing the whole in a way likely. G. Ghigliozzi, Voice Pinocchio, Dictionary Simon and Schuster, flight. 5. Once. 27 Zipoli (learned priest)… they were good together: ready to joke and jealous of their freedom they had in common a passion for music and literature, for the theater, good food and hours piccine. … Driven mainly by the Thouar and Rigutini worked at Giannettino. (biography more fluent and easy to read, nice and bright, Also this is how the majority of subjects and temporal jumps, stands for never having checked the sources of what he says, even if he can boast of being the last living source of unique information on the life of Carlo Collodi after his first biographer Rigutini). 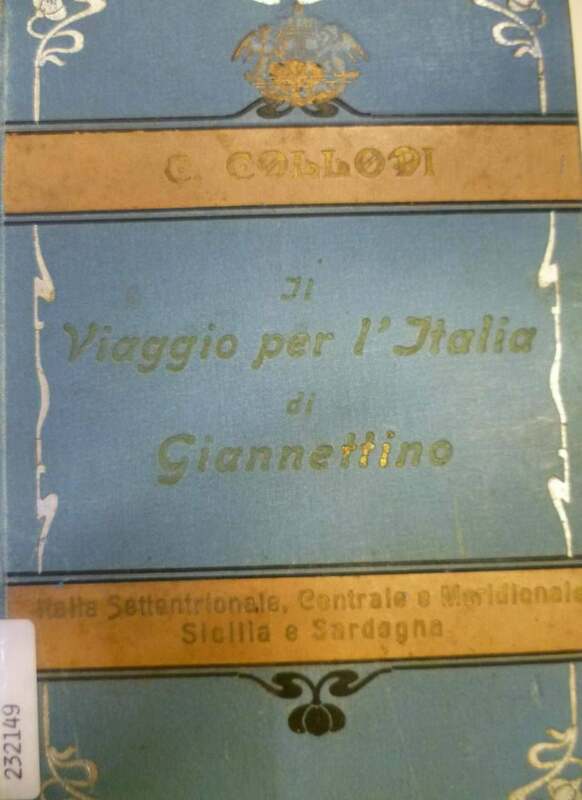 Lina Sacchetti, Letteratura per ragazzi, Florence, Le Monnier, 1954 [not found] found instead with similar title in many other libraries, fra cui Forlì: History of children's literature : European and international perspectives / Lina Sacchetti. – 3. and. expand. – Florence : F. Le Monnier, 1966. – XII, 470 p. ; 22 cm. 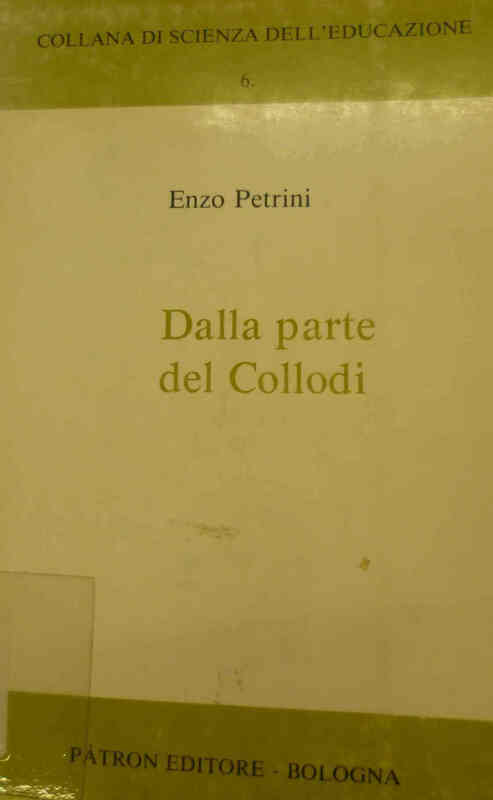 : also speaks of the life of Collodi, with references to Pinocchio, Giannettino and Minuzzolo. John A. PAPINI, Chippings. The sources of Pinocchio, in <<Corriere della Sera>>, 23 June 1954, poi in The light of the world, Vallecchi, Florence, 1955, pp. 405-406 [in the library at Forlì and many other]: A pagina 405 assumed that the tale of Pinocchio is inspired by a popular legend narrated by mothers to their children: a little man of very small wood, who lived in a hollow tree trunk, also assumes that may result from the forest of suicides in Dante's Inferno, or even by the famous joke punctuated by Giusti “The king rafter”. 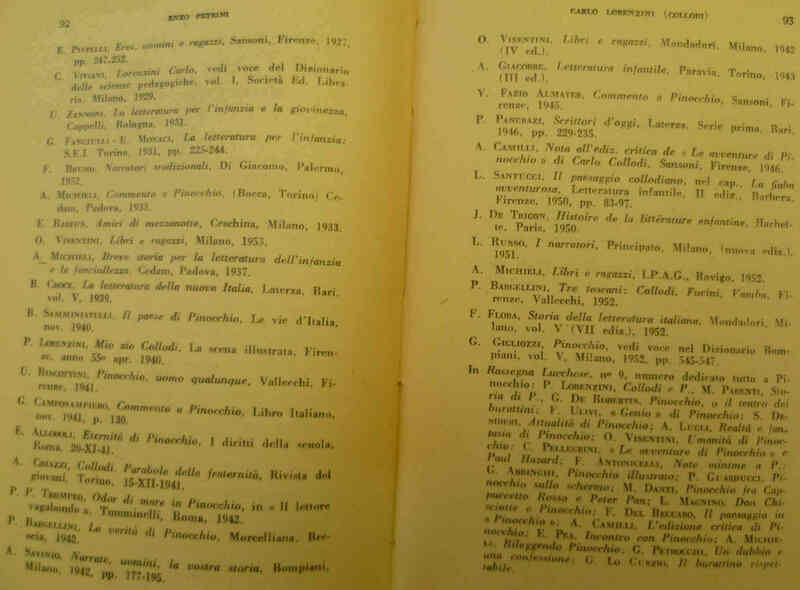 D. Ferraro, Story of a hat and three glasses of wine, in The index oro, Rome, February 1955 [ in 2 libraries of Turin]: I checked the magazine, but this is no more inside. 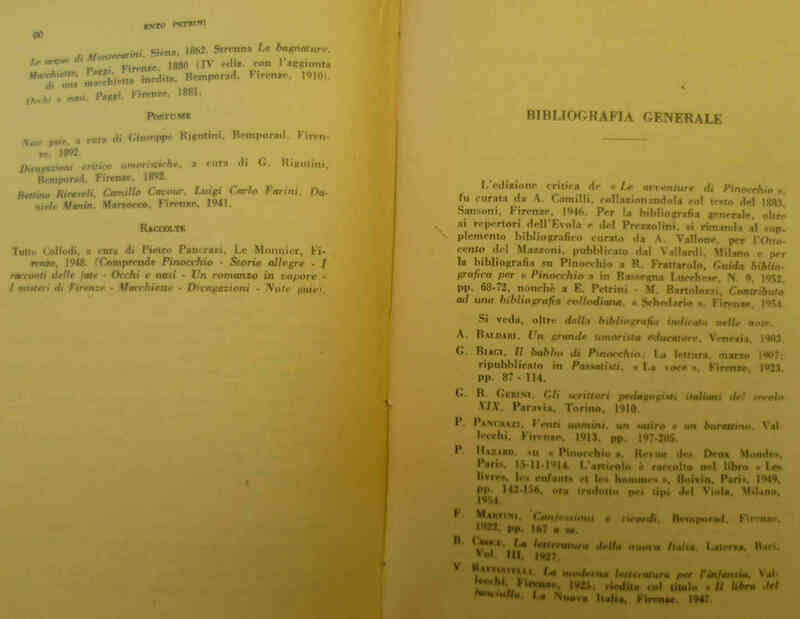 D. Ferraro, Pinocchio and the fruitfulness of tears, in The index oro, April 1955 [ in 3 libraries of Turin]: I have not found any particularly original topic. 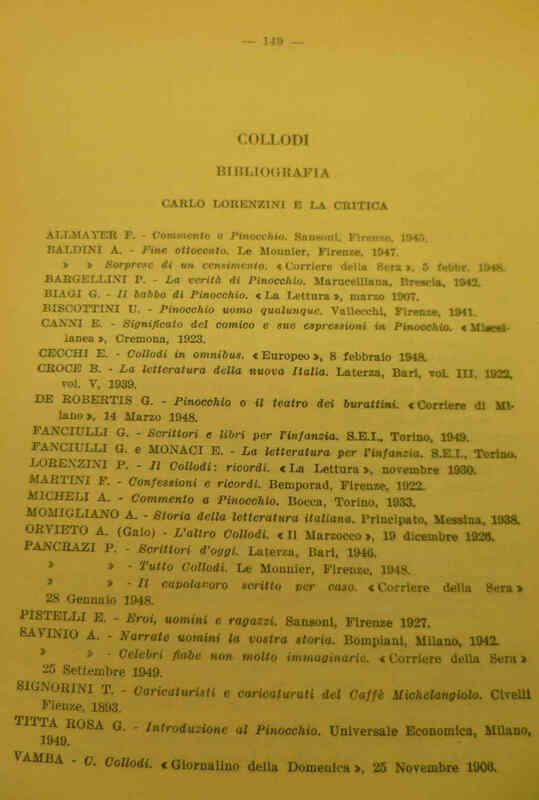 D. Ferraro, Pinocchio and his heart of gold, in The index oro, March 1956 [ in 3 libraries of Turin]: I have not found anything special, just a list of good deeds that he accomplished in the fairy tale Pinocchio. Domenico Ferraro, In Praise of Pinocchio, Palermo, Ediz. 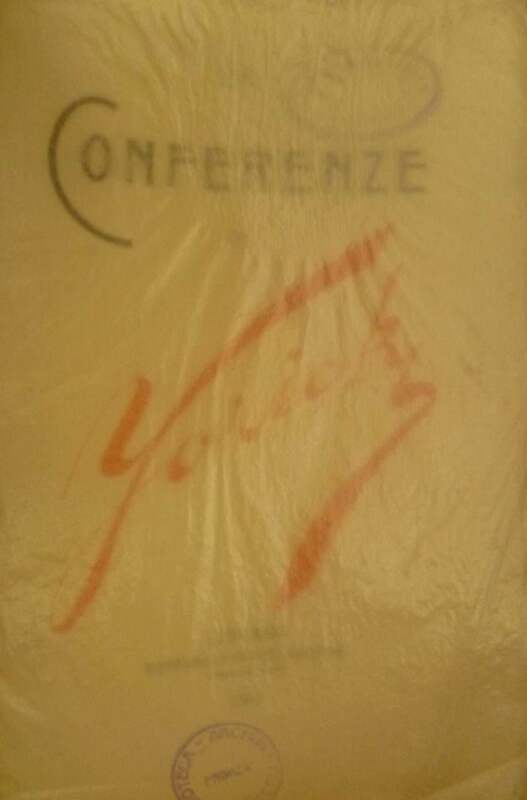 Hall Ercole, 1956 – Palermo – 92 pages ; 19 cm. ((The. 400. [the library in Forli, Faenza, Cesena and Ravenna ]: contains a summary of the biography and analysis of the story of Pinocchio, analysis is one of the worst I've ever read, conicidenza also want it to be the only one to contain their journalistic praise, The brochure highlights then perhaps more praise to himself than to the famous fable. biography including quick summary of the history and major works: Giannettino, Crumb, The trip to Italy to Giannettino, Funny stories, The Christmas Story, After the theater, Who is not afraid not to go to war, The avvocatino, When I was a boy, A carnival mask, ie the subterfuge. Pinocchio and the symbols of the great Opra [library Malatesta of Cesena]: not easy to digest for those who are not expert in alchemy, easier to understand, however, some illustrations instead. 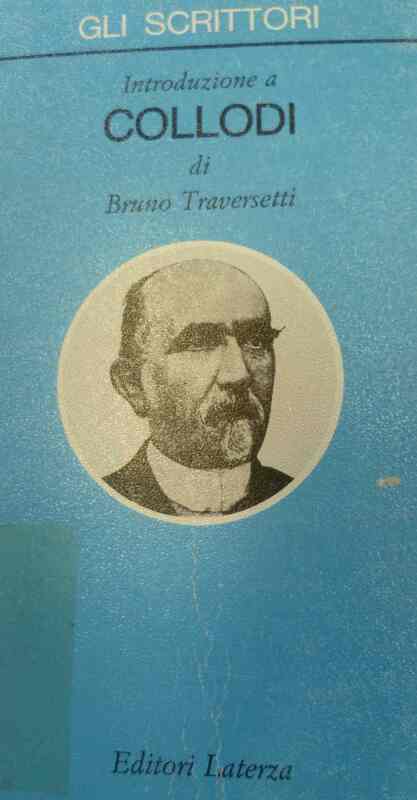 Introduction to Collodi, Bruno Traversetti [library Malatesta of Cesena]: sympathetic references found in the town of Collodi Florence, very precise the foundation of the Lamp, edited history. 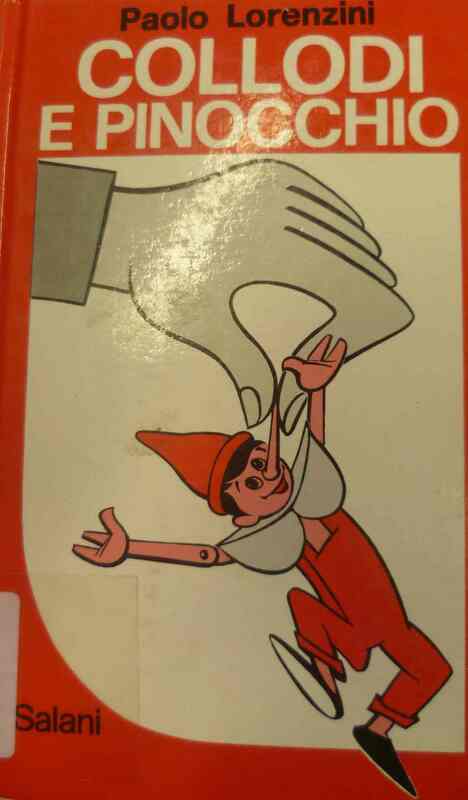 Our Pinocchio [National Library of Rome and Genoa]: It contains an introduction and a few mini Decian illustrations of the tale of Pinocchio. 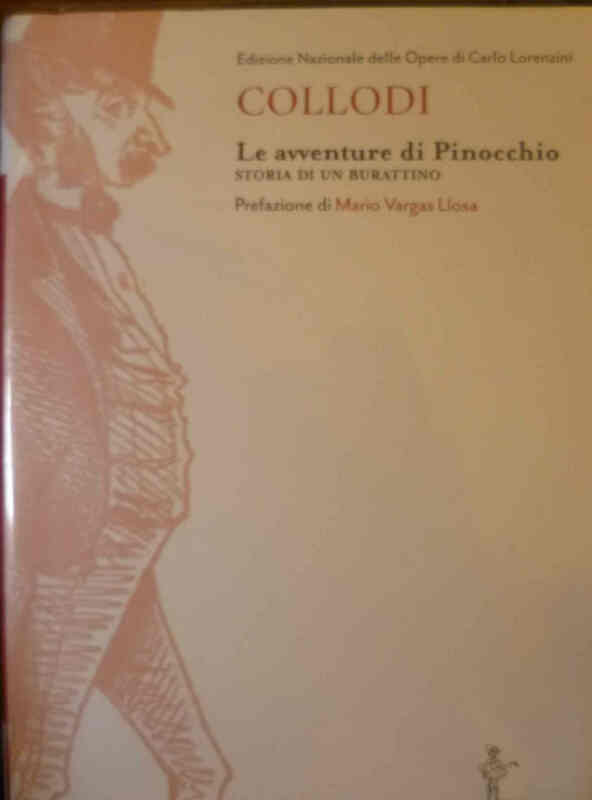 Carlo Collodi in the secrets of writing, Claudio Iozzo – short biography of Collodi's Pinocchio and analis ifavola, with special psychological analysis of the writing of Collodi, and comparison with the writings of Manzoni, Nievo, Rod. 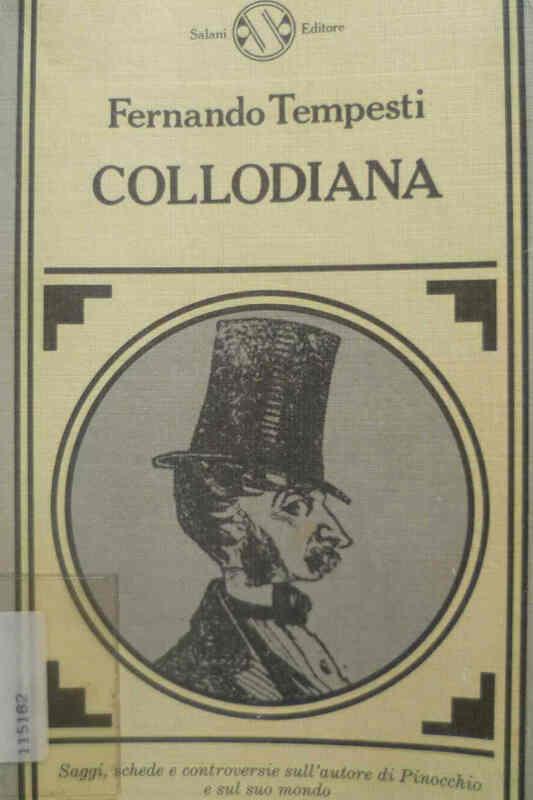 Collodi, edited by Italian Marchetti – biography including quick summary of the history and major works: Giannettino, Crumb, The trip to Italy to Giannettino, Funny stories, The Christmas Story, After the theater, Who is not afraid not to go to war, The avvocatino, When I was a boy, A carnival mask, ie the subterfuge. 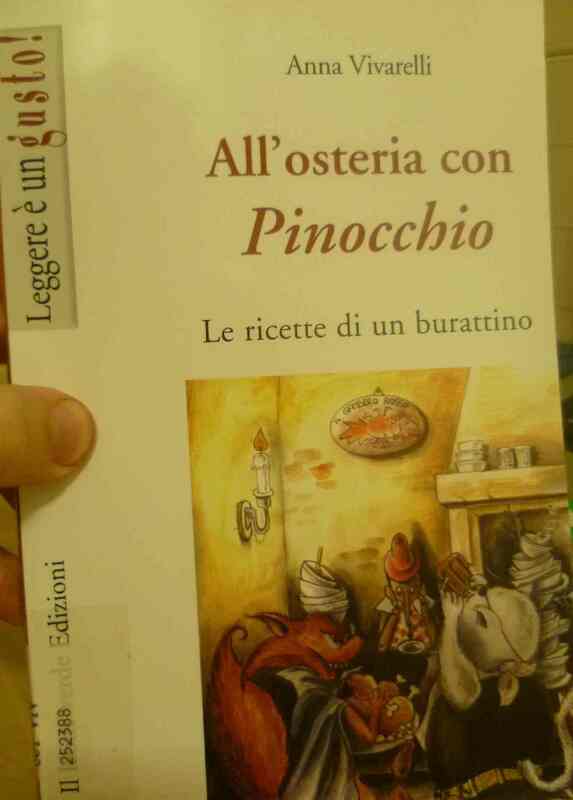 Tavern with Pinocchio, The recipes of a Puppet, Anna Vivarelli – Lists the connections between Artusi and Collodi, and all the recipes of the foods mentioned in the story of Pinocchio that correspond strongly to tasty recipes artusiane. 'THE ADVENTURES OF PINOCCHIO. STORY OF A PUPPET "DI CARLO COLLODI Alberto Asor– in the chart of the study text, can easily be seen as swaying the text of the chapters tends to grow in quantity. 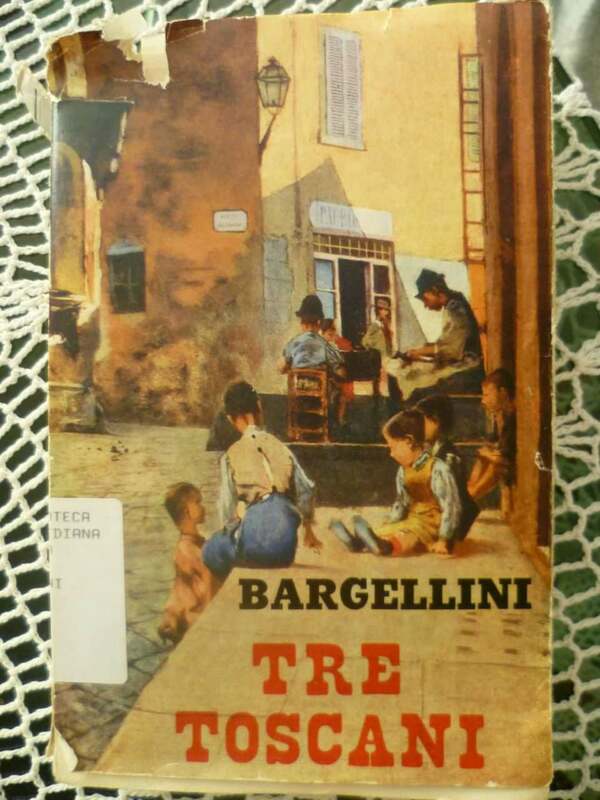 R. BERTACCHINI, Carlo Collodi, in AA. VV., Cultural orientations. Giacomo Biffi, Against Teacher Cherry. Theological Commentary on << The Adventures of Pinocchio>>, Jaca Book, Milan, 1977 – This book was the first analysis I've read of Pinocchio and I must admit that everything is born of the provocation that I was born just by reading this book: the book contains illuminating details, but many similarities in the eyes of what I call universal rationality and common sense, appear out of place and forced. Lexicon Collodi, Roberto Randaccio – Olbia : Taphros,  – Transposition comic eponymous novel by Enrico Costa, Roberto Randaccio – Editions Taphros 2006. 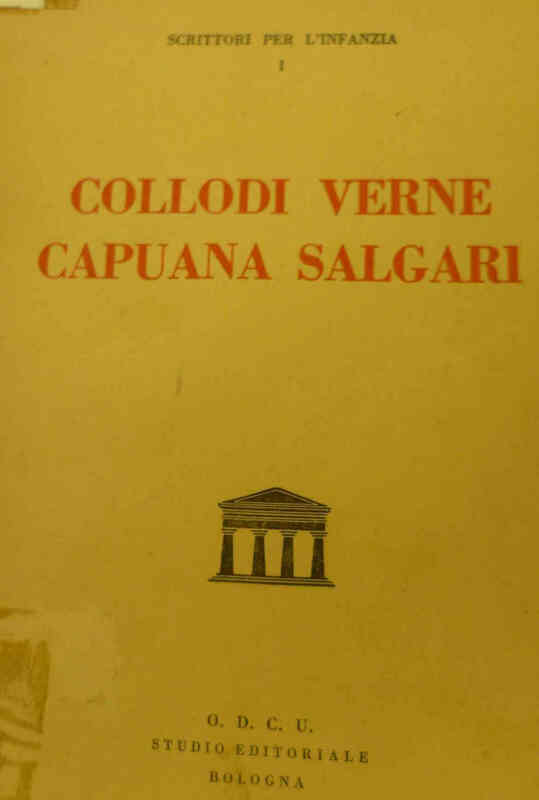 It’ in a collection 144 pages of short essays on Carlo Collodi, conceived and written at different times, with different motivations and recipients. National Edition of the Works of Carlo Collodi; [Florence] : Joints – with notes of the Nobel Prize for Literature Mario Vargas Llosa, and the writer Andrea Camilleri (Did you know that Carlo Collodi has also ventured in thriller? )[Library of Ravenna and other]: They are 3 volumes. 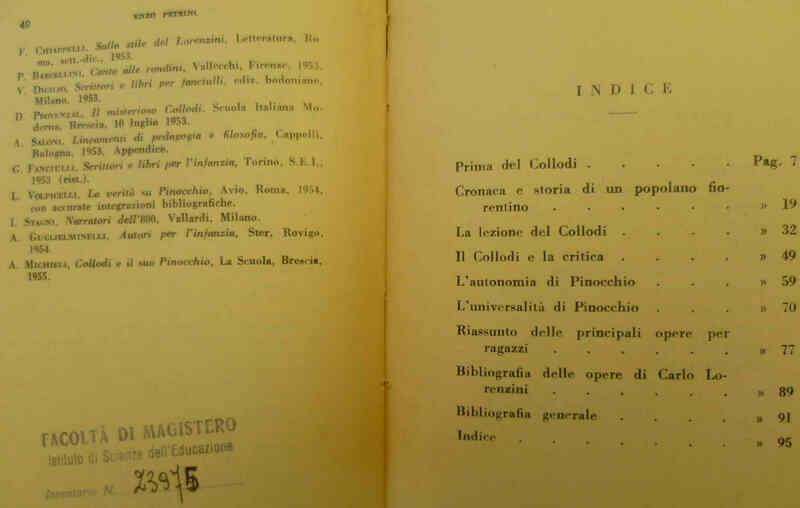 Commentary on the life of Pinocchio, Louis Compagnone , Naples, Marotta, 1966: He does not speak of the life of Collodi, but analyzes only the tale of Pinocchio, I found the original of the licenses, individual and a biblical parallelism: Genesis: God created great whales, and another similar: obey God whales of the sea. 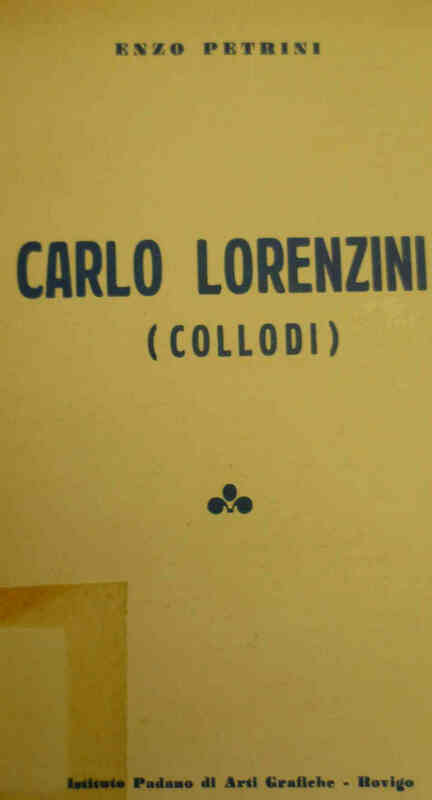 Carlo said lorenzini Collodi, Pinocchio and his son. 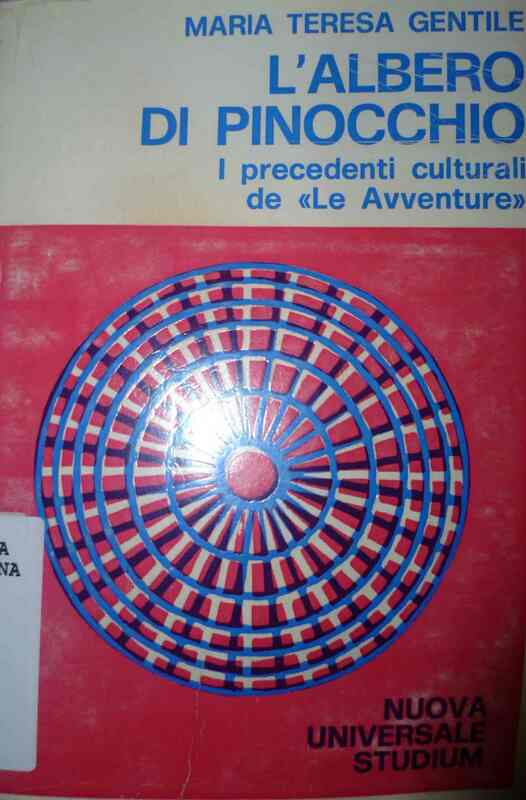 (Monthly magazine of the Opera Montessori Life of childhood in July-August 1991): very well written and fluid, with large arguments from morality education, from politics to the author's life and rapid analysis of some of his works. Men, boys and books: children's literature, di Paul Hazard. 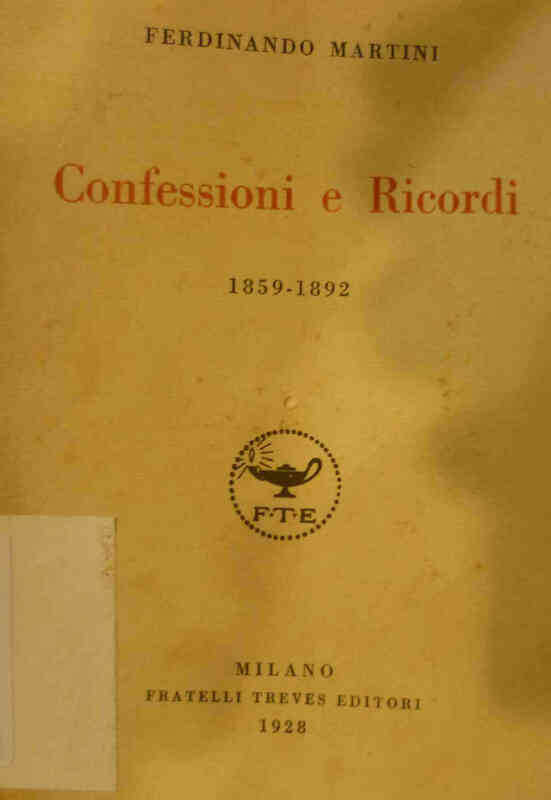 Ferdinando Martini, Confessions and memories, Florence, Bemporad, 1922 [library in the Faenza and Forlì]: interesting in particular his description of Fanfulla and simpaica countered the Pope in response to one of the many anti-clerical articles dedicated to him. The secret of Pinocchio : Travel ignored the famous puppet Collodi / Gemma Rembadi-Morgiardini ; with 73 illustrations by Giuseppe Magni. – 21. and. – Florence [library Archiginnasio of Bologna] : Bemporad & F., printing 1922. – 302 p. : ill. ; 18 cm:new fairytale based on the adventures of Pinocchio, overturning and mixing events, species as a mix between the Giannettino and Pinocchio, for further pause for reflection teaching. It offers some parallels between the gospel and the tale of the puppet, of which only 2 the 3 backs, others seem to be wrong or made almost at random. Pinocchio The Heretic – Witch, shaman, holy, puppet, Mauro Quattrina: is an original reinterpretation of Pinocchio, mingled with parallelisms between devils bible, Demons, witchcraft, inquisition, masonry. The Mystery of Pinocchio, Giacomo Biffi- Leumann : Elledici, c2003: Catholic vision of the tale of Pinocchio: bed. 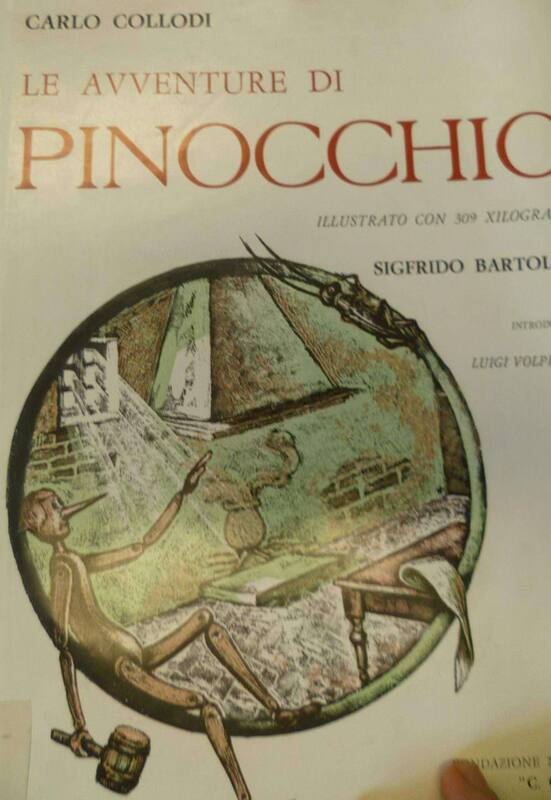 Pinocchio in art magician, Morena Poltronieri and Ernesto Fazioli: psychological analysis, alchemica, Masonic, astrologica, Tarot, Monthly, cabalistic, the tale of Pinocchio, very interesting ideas though sometimes a little depth. 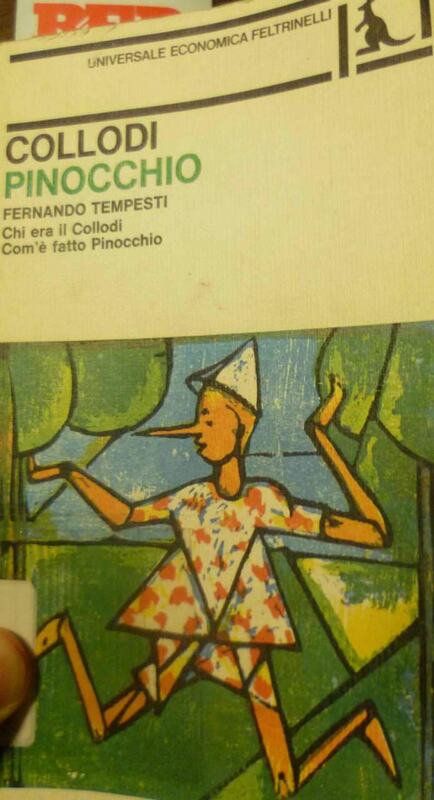 Pinocchio : a fairy tale for adults, Delio Carnevali. 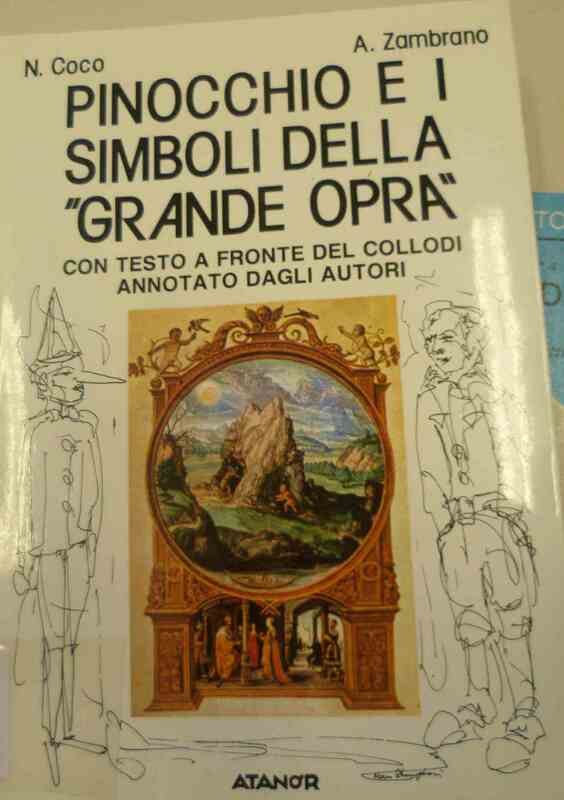 This biography curiously sees Pinocchio in Collodi's autobiography, even the search for God, in sole 61 pages 12euro. 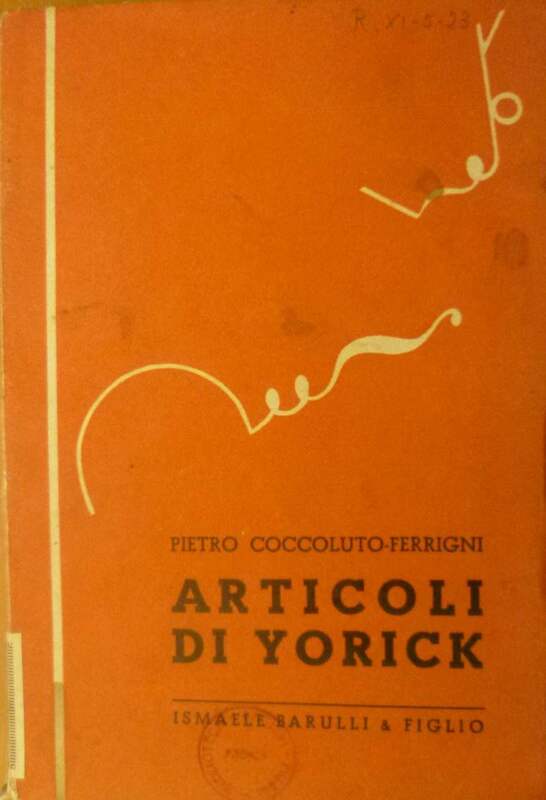 Pietro Cossa and Roman drama / Yorick (Peter Coccoluto-Ferrigni). – And. posthumous. – Florence : F. Lumachi, 1905. – XII, 261 p. ; 19 cm. [library Archiginnasio of Bologna]: bed. The death of a muse / Yorick (Peter Coccoluto Ferrigni). – 2. and. posthumous. – Florence : Bemporad, 1902. – 71, 582 p. ; 18 cm [library Archiginnasio of Bologna(possess only the 2nd volume)]: sympathetic when he describes the bigamy of Count Glauco, that will be readily cured by the Pope with a matrimonioa in 3. Jousts and tournaments : (1313-1883) / Yorick figlio di Yorick (P. C. Ferrigni). – Rome : Fanfulla, 1883. – 149 p. : ill., 2 ritr. ; 19 cm [Library Archiginnasio]: describes the knights in the Middle Ages, cute when he defines as the leggitrici “the most beautiful half of humanity” (page 108) and when to refer to a period of history says that at that time “the Jesuits had already invented the finger of God”, paradoxical, even when using the ends “Christ the armed”. The king is dead / di Yorick. – [S.l. : s.n.] (Florence : Tip. Art of the Print, 1878). – 16 p. ; 14 cm. 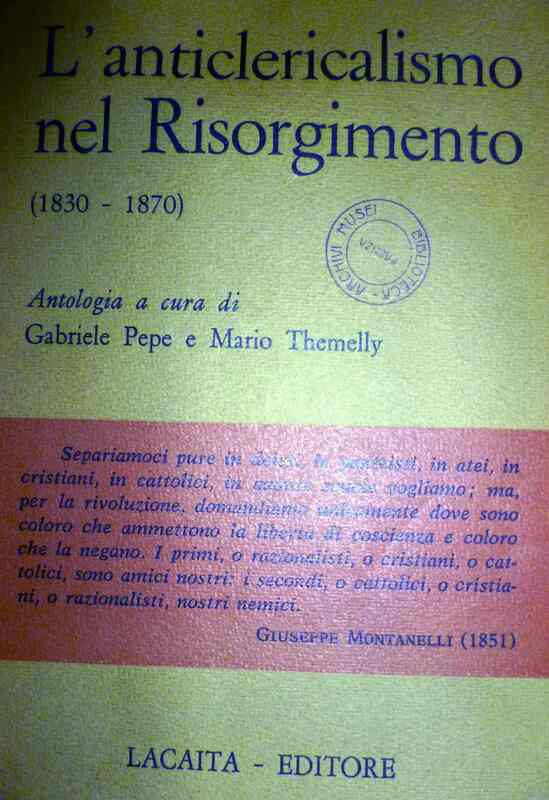 [library of the Risorgimento Bologna]: mini brochure that ends with the phrase: The king is dead… Long live the king! The pointy hat – The jew medieval Christian art in the mirror by Chiara Frugoni [Library of Cesena Manfredi]: pointed hat, symbol of the feeling of anti-Semitism since its inception, from the Crusades in the Middle Ages. The Don Pirlone : journal of political caricatures. – A. 1, n. 1 (1 set. 1848)-a. 1, n. 234 (2 July. 1849). – Rome : [s.n. ], 1848-1849. – 1 in. : ill. ; 32 cm. ((Daily. 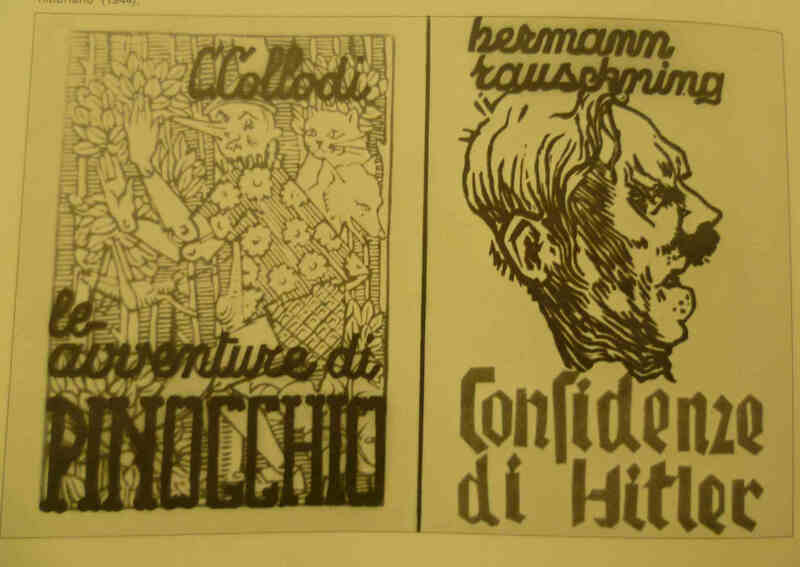 [Library of Cesena, Ravenna e San Marino]: journal of political caricatures with anonymous articles, often censored by police censorship, redazioen and harassed by the police. History of Ancient caricature / by Champfleury. – 2.eme edition tres-augmentee – Paris : It. Dentu, 1867. – XXIV, 332 p.,  c. of pi., ill. ; 19 cm. [library Malatesta of Cesena]: nice history of caricature. Political caricatures / Adolfo Matarelli (Bush). 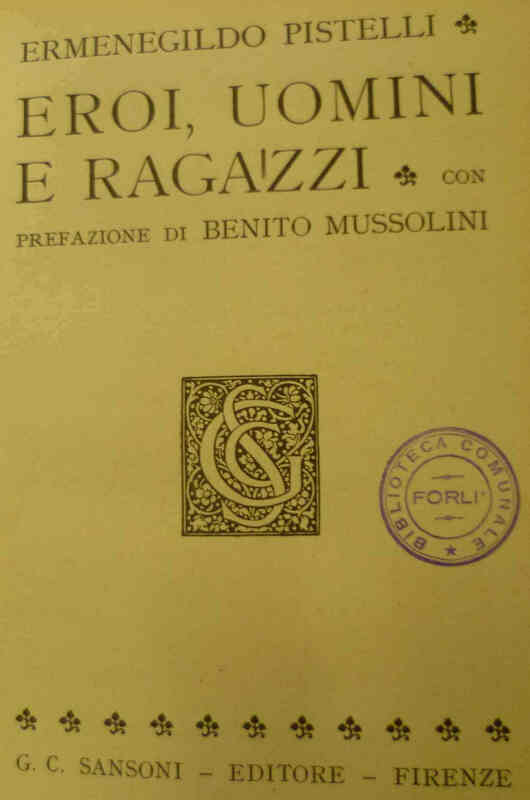 – Milan : Publisher Sonzogno, 1942. – 134 p. : ill. ; 25 cm. ((Nel front. : Sprite 1882. [library Malatesta of Cesena]: fine exhibition of caricatures of Matarelli, but has a much larger collection of historical reality. Yorick al cav. lawyer Ugo Chiellini XVII January 1883. – In Livorno : the typography of Franc. Vigo, 1883. 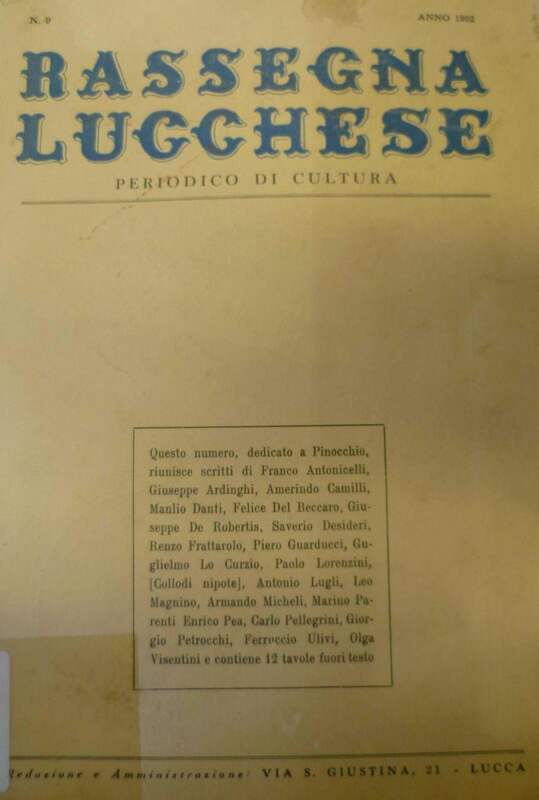 – 14 p. (16 cm) [available at the library Classense of Ravenna]: contains a short booklet with a public letter to the lawyer Ugo Chielini, reading it quickly and carelessly, I have not found anything particularly exciting or cheerful. God helps those who help themselves (Self help) : or history of the men who were able to rise up from nothing to a highest degree in all branches by human activities […] / [of] Samuele Smiles ; [translation it.] Caesar Donati. – 23. and. – Milan : Treves, 1890. – xv, 320 p. ; 20 cm. [although it is present in many ancient libraries]: huge exhibition of important people who have made a career out of nothing, the text is too technical and old-fashioned for a modern reading, Yet in his time was a great success. <<*Repertoire of poisons and contraveleni>> 2 / Doctor Gioacchino Taddei. – Florence : the typography of L. Piebald, 1835. Tribunals umoristic / Yorick figlio di Yorick (Chambers. P.C. Ferrigni). 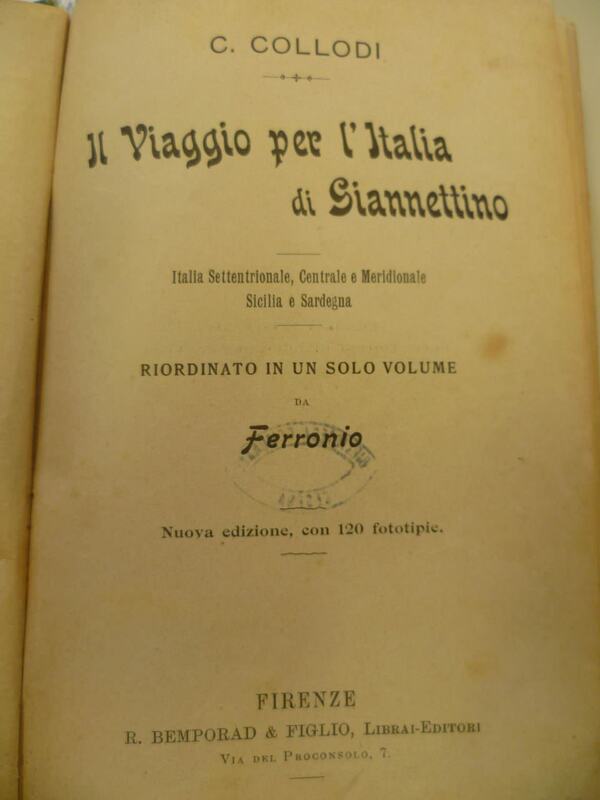 – Florence : Salani, printing 1902. – 218 p. ; 18 cm. 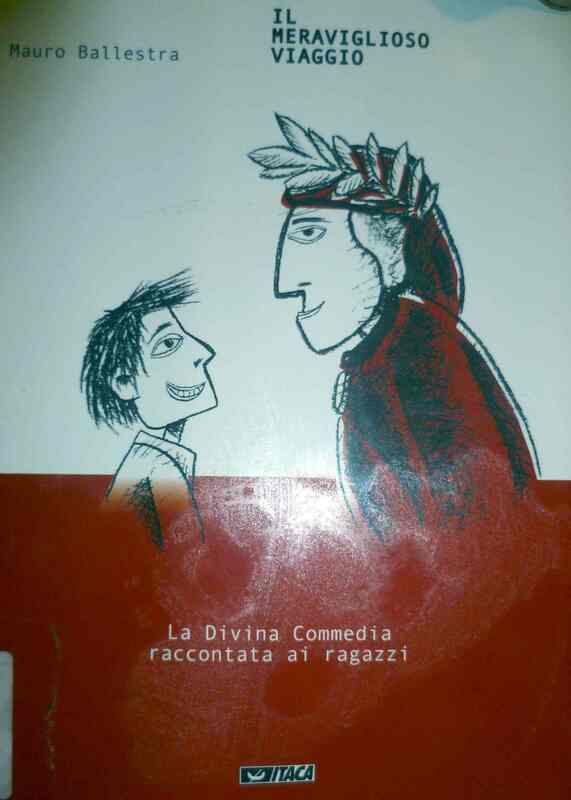 [available at the library classense of Ravenna]: carreallata of a delicate and playful humor stories, many of which, however, possess a tragic end to injustice, often because of the fault of the judge of the court, containing many allusions, I have not bothered to check if the stories were real or invented. AA. 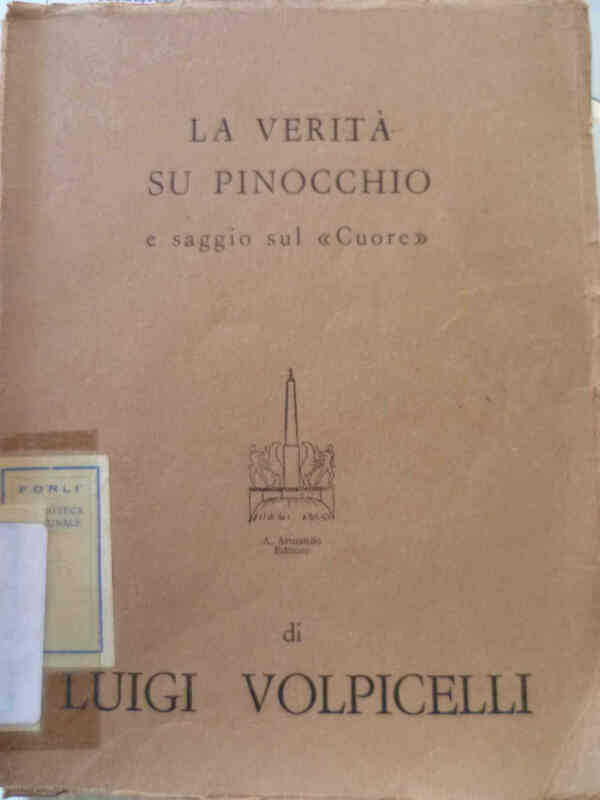 VV., Tribute to Pinocchio, "Review Lucchese», 9, 1952 then Pescia, Papers of the National Foundation "Carlo Collodi", 1, 1967. Duce truce : insults, jokes, caricature: popular opposition to fascism in the secret reports of the prefects (1930-1945) / Alberto Vacca. – Rome : Castelvecchi, 2011. – 315 p. ; 21 cm. [Library of Forlì]: there's a joke that face at least smile.